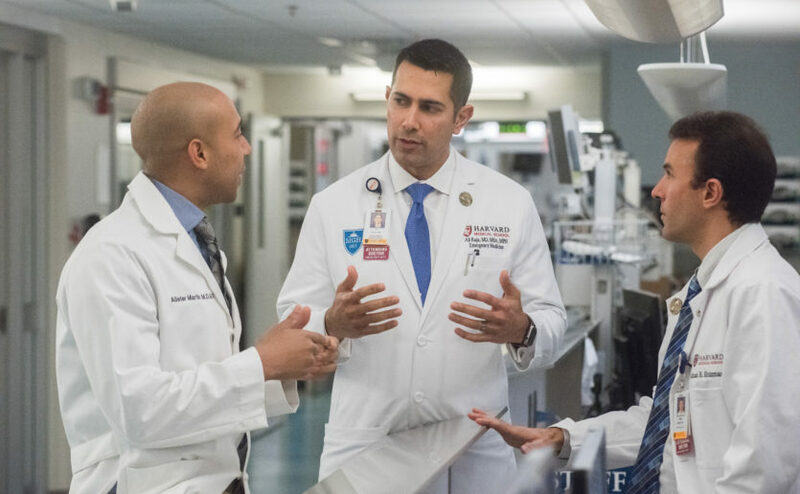 Ali Raja, MD, vice chair of the Department of Emergency Medicine (center) confers with emergency physicians Alister Martin, MD, (left) and Kamal Medlej, MD. The Mass General Emergency Department tackles the opioid overdose epidemic with new training and quicker access to a key medication. Never known to shy away from a crisis, the Emergency Department at Massachusetts General Hospital is mobilizing on a new front to address one of the most pressing issues facing American health care — the opioid overdose epidemic. Medication for addiction treatment is the most effective treatment available for opioid addiction. Mass General emergency medicine clinicians, who handle the most life-threatening situations daily, are changing long-established protocols to become the first emergency department in the state and one of the first in the country to initiate medication treatment for patients with opioid addiction. Medication for addiction treatment is the most effective treatment available for opioid addiction. Compared to treatment without medication, it improves the likelihood that patients will stay in treatment and abstain from using dangerous opioids. The risk of death is also reduced. To deliver such medication treatment, Mass General emergency clinicians are training to qualify for federal waivers allowing them to prescribe buprenorphine. The medication works by attaching to the same opioid receptors in the brain as heroin, oxycodone or fentanyl. It allows people to function normally without causing a high. Bridge Clinic Director Laura Kehoe, MD (left), and Sarah Wakeman, MD, medical director of the Substance Use Disorder Initiative, train emergency clinicians in the use of medication for addictions treatment. The “Get Waivered” program was conceived last fall by a young emergency medicine resident, Alister Martin, MD, MPP, in collaboration with Mass General’s Substance Use Disorder Initiative (SUDI). The SUDI is a high priority, $5 million-a-year hospital-wide program. It is comprised of an inpatient consult service, a Bridge Clinic for follow-up treatment, recovery coaches and enhanced care in Mass General’s health centers and primary care practices. The Emergency Department plays a pivotal role. “Thousands of people come to our emergency room every year because of consequences or complications of opioid use,” says Sarah Wakeman, MD, SUDI medical director. “There’s a tremendous opportunity to engage with these people at the moment they are seeking help and connect them with our system.” The goal is to help people who come to the Emergency Department begin treatment immediately and connect to ongoing care. Dr. Wakeman and Bridge Clinic Director Laura Kehoe, MD, train clinicians in buprenorphine prescribing so they can qualify for the necessary federal waiver. It’s a sea change for the Emergency Department. Traditionally, it has been dedicated to saving lives of patients in the midst of an immediate, life-threatening crisis, like a heart attack or traumatic injury, not those with chronic relapsing health conditions like substance use disorders. When Mass General launched SUDI in 2014, it created an in-house Addiction Consult Team and a new Bridge Clinic for follow-up treatment and counseling. Soon, these programs began collaborating with the Emergency Department, offering consultations for patients with opioid addiction and often transitioning them immediately to the Bridge Clinic to begin medication treatment and engage in care. But Dr. Martin, who arrived at Mass General at the same time, thought another step could be taken. Research shows that medically supervised withdrawal, frequently referred to as “detox,” doesn’t work, he points out. People nearly always relapse. A landmark 2003 study showed that 100 percent of patients who were randomly assigned to supervised withdrawal followed by a year of counseling relapsed. Twenty percent died within the year. But 75 percent of those randomly assigned to buprenorphine treatment for a year stayed in treatment, 75 percent were abstinent, and none died. Using his training in behavioral economics from Harvard Kennedy School, he assembled a team to design the program, which included interviews, surveys, a website and a Twitter feed. The goal was to enlist the faculty emergency physicians — known as “attendings” — to take the 8-hour training course with Drs. Wakeman and Kehoe. After the Emergency Department leadership got involved, others followed. Today, 90 percent of the attendings are trained as are some of the residents, nurse practitioners and physicians assistants. Philanthropic support is helping to fund the training. More donations will help train more clinicians and support patients in their ongoing care. On a recent afternoon, Dr. Raja strides down a busy hallway into the Emergency Department’s acute care area where the most seriously ill patients are treated. Stopping in front of a closed door, Dr. Raja turns to department pharmacist Lanting Fuh, PharmD, and asks permission to enter the “med room.” Inside, a large metal vault spans one wall. Dr. Fuh punches a code and a drawer slides open, revealing a plastic bottle containing two doses of buprenorphine. Dr. Raja lifts it out. “It’s not a pill. It’s a film that dissolves under the tongue,” he explains. “It’s designed to deter misuse. You can’t inject it or snort it without getting sick.”One or two doses of buprenorphine can protect a patient who is leaving the emergency room from going into drug withdrawal until he or she can make it to the Bridge Clinic for further treatment. “The goal is help them get their lives back,” Dr. Raja says. Mass General’s Emergency Department is the first in Massachusetts to initiate medication treatment for patients with opioid addiction. Recently waivered emergency physician Kamal Medlej, MD, says he feels more prepared to work with patients who ask for help. Having joined Mass General in 2017, he recalls the frustration of previous jobs where no addiction services were available. In one memorable case, a young man walked in with his father seeking help for heroin addiction. “At the time, all I could do was print out a list of programs for him to call,” Dr. Medlej says. But they had already called the programs and found no openings. Upon arriving at Mass General, he was happy to learn the hospital has addiction consultants who come right into the emergency room. Now with his training and legal waiver, Dr. Medlej says he knows that prescribing buprenorphine is a safe treatment and he feels prepared to have the conversation with patients seeking help. It’s empowering, he says, to be able to provide a treatment and give hope to patients and their families. For more information about the Mass General Substance Use Disorders Initiative or to make a donation, please contact us.